It was so pleasant this Christmas with the lack of white powder on our lawns! We had way too much snow in October! At this time last year we in the northeast were digging our way out of the Nor'easter that arrived the day after Christmas. It fell with a frenzy causing trying travel plans for many. The MetroNorth schedule to NYC changed drastically during that period. Months later a tornado, a microburst, an earthquake, a hurricane and then the infamous Halloween Nor'easter all made their appearances during the year - some in small and others in very large ways - some at and some very close to home. Fortunately in the 'Meadow, the tree debris from our Halloween surprise has been collected, chipped and removed! Other towns and cities are still recovering from the June 1 tornado. 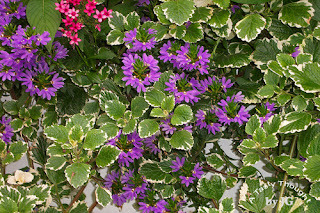 During the winter months I always anticipate visiting the beautiful gardens at Stanley Park in Westfield, MA. 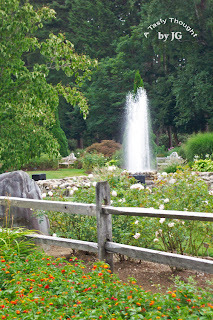 Stanley Park is about 35 minutes from my home. 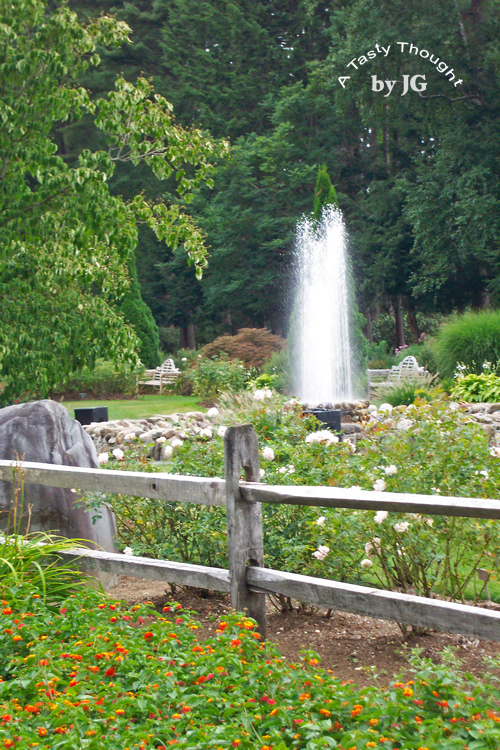 This gem in Western MA is open from May to November and is a gorgeous area to visit and to collect gardening ideas and tips for the home landscaper. 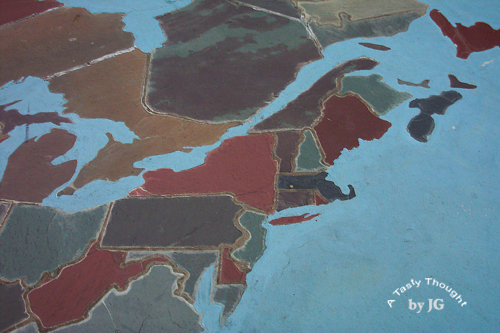 The slate map above is located in front of the Carillon Tower. The Covered Bridge and the Rose Garden are also always fave spots to visit. 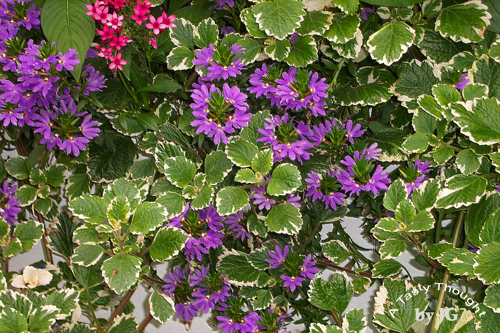 The colors and the varieties of annuals blend together! With less trees in our backyard there will be more sun this coming year. Perhaps an Herb Garden will have a spot! It's time to start planning! The nostalgia did not last long. 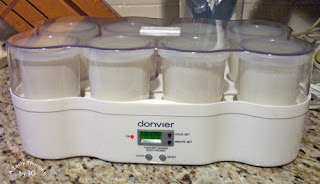 There was Yummy Yogurt to prep. With all of the hubbub of getting ready for the holidays, the healthy staple foods that we enjoy daily need to be located quickly when the fridge door is opened for the next few days. Yogurt is a food my fam has always devoured. Need that calcium! Today my two Donvier Yogurt Makers quietly did their thing. The 16 six ounce containers will last a few days. :) The 16th container will be saved as the culture, so the next new batch can be made - next week. I will be settling in to finish one last project using my Janome (sewing machine). This weekend will be filled with FUN! It was deja vu! Our home felt a tad chilly when we awoke this AM and my first thought was recalling where I'd stored the remaining packets of Taster's Choice instant coffee. After our electricity was restored following the Halloween Nor'easter just weeks ago, there were 5 packets left. Now, I need my hot coffee in the AM. Our gas stove allowed me that necessity then and I definitely wanted it again - our indoors thermometer read 55°F. A few hours later, the electricity was once again restored and I'm now back to preparing for the fun weekend ahead. That includes baking a batch of White Chocolate Craisin Oaties! 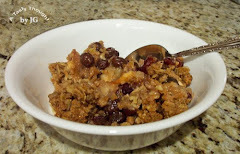 I'll use my recipe for Craisin Raisin Oaties (printable recipe) with a couple changes. The added Nutmeg - oh yes, yummy! 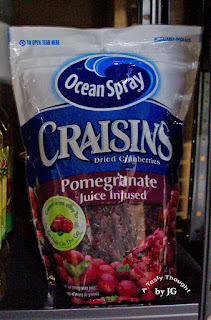 Use 3/4 Cup Craisins (dried cranberries). Baking Time was 13 minutes. White Chocolate Craisin Oaties are so good! This weekend I baked a batch to bring to our neighbors' gathering. During the baking process, there was definite "quality control" testing going on. After all, one cannot offer a dessert that does not meet the "absolutely yummy I want another" standard. :) It was sure difficult to eat only two while baking! Who would guess that the new addition to my fabric scrap stash would come in handy so quickly? It was the beginning of another quick and easy Christmas project. The colorful fabric strips on my new bright Christmas Guest Towels is leftover fabric from my current project. Two years ago I wanted Thanksgiving themed Guest Towels, but while searching in stores I never found any that suited my fancy. So, I purchased colored towels and made them to order. It worked so well! 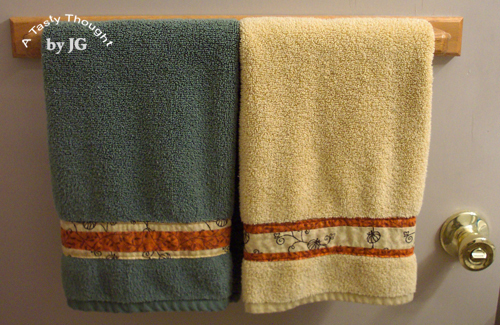 The towels have endured many washings and remain a vibrant color. 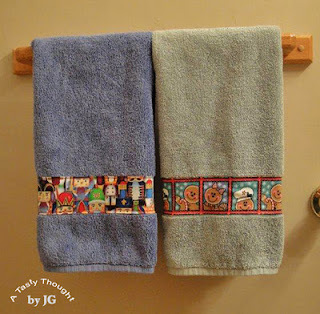 While they were hanging in our bathroom this November it reminded me that another holiday was approaching and ideas started to flow - Christmas Guest Towels. 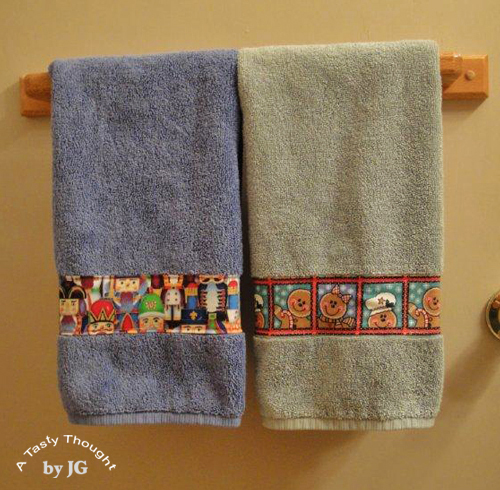 The chosen colors of the newly decorated hand towels go well with the fabric design and also with the colors in our bathroom. A BIG + is that they were very simple to make. After purchasing (via a good sale) 2 new towels I was ready to start. A strip of fabric was cut to fit into towel's recessed area near the bottom edge. The strip is 2" longer than the towel's width. That way I have an extra 1" on each side to play with when doing the finishing work and sewing. The height of the desired strip is measured 1/2" larger than needed, so both the top and the bottom may be turned in 1/4" and pressed. The raw edges on each side of the strip are turned in also, pressed and then turned in again and sewn in place. When sewing strip in place: I like to wrap a very small portion of the colorful strip around the backside of the towel when attaching, so I allow for an extra 1/2" on each side. 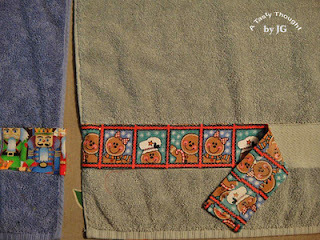 Pin the strip onto the plain portion of the towel's front and sew in place. Really easy! 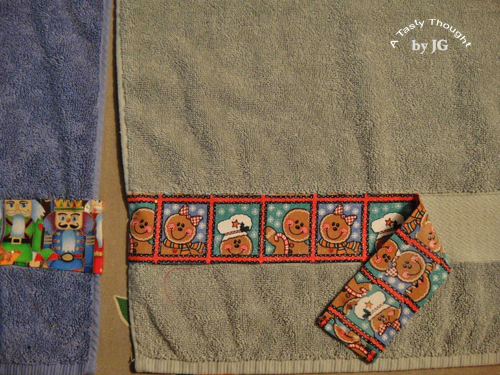 ﻿These Guest Towels also make quick, small and festive Christmas gifts! I am adding this post to my Threads with Taste Page (located below my header) above. 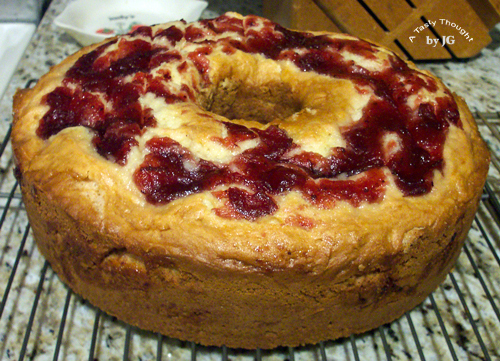 There is only one way that my family enjoys Ocean Spray Whole Berry Cranberry Sauce - and that's in CranOrange Coffee Cake! Enjoying a slice of this moisty colorful cake after dinner on Christmas Day has become a tradition. During the holiday season it can be baked early on, cooled, wrapped in foil and placed in the freezer. Then, the day before serving, this cake (that is baked in a Bundt or Tube Pan) is defrosted and an Almond flavored icing drizzled over the top. Yum! Years ago, I used Ocean Spray CranOrange Relish when preparing this tasty dessert. Since I no longer can locate this item in grocery stores, the Whole Berry Sauce combined with 1 and 1/2 teaspoons of Orange Extract works very well. ﻿﻿﻿I try to use less Whole Eggs when baking, so rather than use 2 Whole Eggs, I use 1 Whole Egg + 2 Egg Whites in the batter. 1 Whole Egg = 2 Egg Whites when baking. Fat Free Sour Cream is also an ingredient. The recipe for our favorite cake is below. Time: Bake 55 Minutes or until cake tester or toothpick comes out clean. Spray 9" or 10" Bundt Pan or Tube Pan with PAM & flour. Using mixer, Cream Margarine/Butter with Sugar. Add 1 Whole Egg + 2 Egg Whites (or 2 Whole Eggs) and blend well. Add dry ingredients alternating with Sour Cream. End with the dry ingredients. Combine 8 ounces Whole Berry Cranberry Sauce with 1 and 1/2 teaspoons Orange Extract in separate bowl (if using). 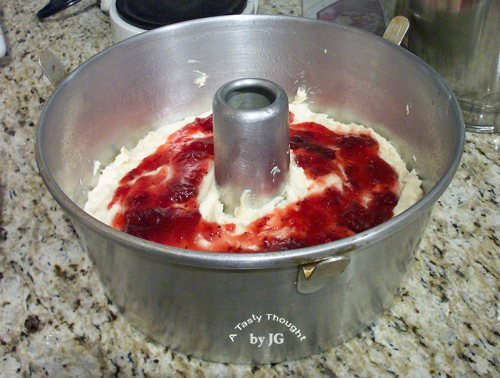 Place 1/2 of batter in Bundt Pan, spread evenly. Top with 1/2 of Sauce, spread. Carefully add remaining batter, spread. Follow with remaining Sauce, spread. Bake at 350°F for 55 Minutes or until cake tester or toothpick comes out clean. Remove cake from pan and cool. After cooling, wrap in foil and freeze until needed. The day before CranOrange Coffee Cake will be served, defrost and drizzle with Topping. Topping: Blend 3/4 Cup Confectioner's Sugar, 2 Tablespoons Water + 1/2 teaspoon Almond Extract until smooth. Every year we enjoy this delicious CranOrange Coffee Cake with an Almond Icing! And...a small scoop of vanilla ice cream on the side! The beginning of this week my "to do' list includes baking and freezing our Christmas cake. Does your family enjoy a special cake during the holidays? The idea was easy enough to complete. The 2 throw pillows on one of our sofas downstairs needed to be replaced. Sure, a quick trip to a local store (with a coupon) would have completed the project. However, I do have a stash of fabric and also a Janome sewing machine that has allowed me to "whip up" some mighty fine items. :) After purchasing my Janome a few years ago, I checked out their website and found directions for Throw Pillow with Envelope Back. I had bookmarked the directions for another day. That day had come! The directions were easy to follow. Newspaper, pencil, yardstick and scissors in hand, I made my pattern. The fabric was in my scrap stash, mostly leftover from our bathroom curtains. 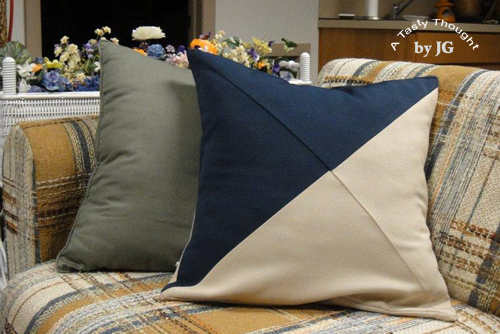 The colors - tan + navy blue would work well with our sofa. The only issue was the needed amount and my scrap fabric was not continuous. Patchwork designs are so pretty, so that settled it. The envelope pillows were made and the old pillows stuffed inside. Now, I'm ready to tackle the project of making the pillow shams to match our new quilt. The fabric, grosgrain ribbon and thread have already been purchased. That was a great practice run! Maybe, after the holidays! 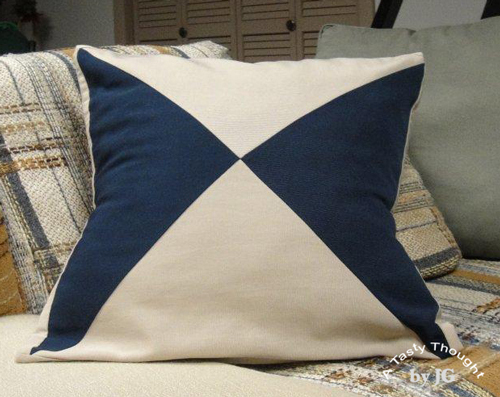 These Throw Pillows make a quick and easy gift just in time for the holidays! Do you have a favorite cookie that you bake every year for a special holiday? The variety of cookie that beckons a sampling as soon as the first dozen cookies are removed from the cookie sheet and are cool enough to handle. I sure do! For me it's Sour Cream Sugar Cookies! For over 30 years I've baked these rolled and cut out scrumptious treats (containing a hint of Nutmeg) in early December. They freeze so well that they are stored in our freezer and are ready for Christmas week. Last year I shared this recipe and it's the perfect time for me to do so again. These soft, light, rolled out delicious cookies are fun to make not only because cookie cutters and colored sugars are used, but the two step or overnight process means the dough is prepared one day and refrigerated. On the second day the rolling pin, pastry sheet and cookie cutters are used. 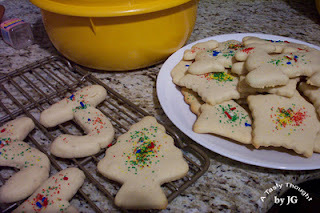 So fun to bake with your children or grandchildren! 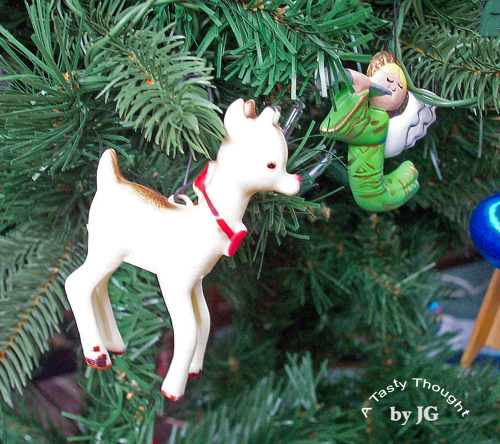 There are also other times during the year when my cookie cutters and my red/white rolling pin are located and used. However, before Christmas they are always used! Now, it's time for me to sit in front of my Janome and finish my sewing project! Do you have a favorite holiday cookie?